BANGI, 12 August 2014 – The future of Malaysia’s domestic and export-driven economy lies in its small and medium enterprises (SMEs) as they account for 99.2% of all business and companies in the country. Chief Executive Officer of SME Corporation (SME Corp) Dato’ Hafsah Hashim said SMEs thus form not just the backbone of industrial growth of the country but are also the country’s game-changer for the future. In a talk Pioneering Business Transformation at The National University of Malaysia (UKM) here today, she said SMEs also provide employment for about 56% of the workforce. She was one of the guest speakers at UKM’s Emerging Markets Business Conference here today which included elder statesman Tun Dr Mahathir Mohamad and UKM Vice-Chancellor Professor Dato’ Dr Noor Azlan Ghazali. Dato’ Hafsah said SMEs are so important to the wealth of the nation that 15 ministries and 61 government agencies are involved in SME work. A medium-sized enterprise is one with an annual sales turnover of less than RM 50 million and employs less than 200 workers while a small industry has less than RM 15 million turnover with less than 75 workers. The majority of SMEs are the so-called micro businesses with sales turnover of less than RM 300,000 and a workforce of less than five. Dato’ Hafsah said the strengthening the country’s SMEs would boost domestic demand thereby providing a solid consumer base for local manufacturing and retail output. It will also help the local economy weather global economic downturns when export demand falls as had occurred during the 1997 Asian financial crisis and the 2008 world financial meltdown. 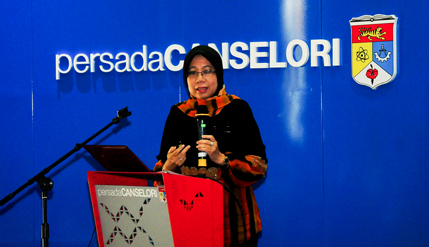 Dato’ Hafsah said incentives such as micro-financing and the Goods and Services Tax (GST) should boost small businesses and encourage new entrepreneurs. She said the GST will only be mandatory on companies with sales turnover of more than RM 500,000 and it will ease a lot of financial burden put on companies by the combined 16% sales and service tax now in place. Companies with turnover of less than RM 500,000 can voluntarily adopt and implement GST if they so wish. The incentive is that if they do so they will be entitled to claim the GST levied on raw materials or inputs used on manufacturing the taxable supplies or goods. She said the GST will be a boon to small businesses in terms of reduced costs of business supplies, improve export competitiveness and better governance. Dato’ Hafsah also called for the bankruptcy laws be amended so that small and medium businesses can be given a second chance at loans. Often, a budding entrepreneur is declared insolvent merely because he stood guarantor for other people’s business loans or even for scholarships or study loans. Another area needed urgent reform is the complex licensing of companies which she said are so lengthy and can be very difficult that new entrepreneurs may be put off by all the requirements. “Why not allow small enterprises be registered in 24 hours, like in the developed nations?” she asked. SME CORP was set up by the government, which noted the importance of strong SMEs, to facilitate its growth and make it a strong economic player in the country and in the world export market, she said. Dato’ Hafsah said development of the SME is a critical component for Malaysia to achieve strong economic growth towards becoming a developed nation by 2020. Among those attending the conference were university staff, exchange students from Poland and Mexico and undergraduates from ASEAN universities taking part in a youth volunteer programme organised by UKM.